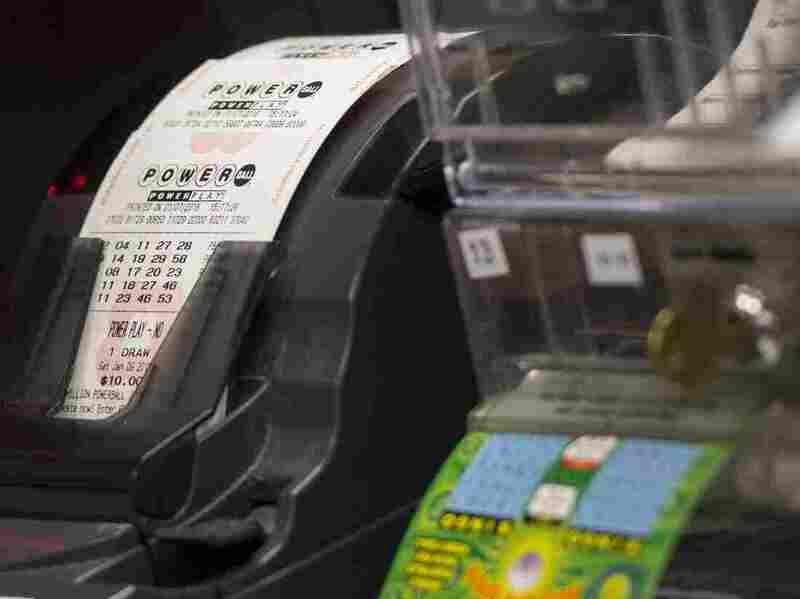 $900 Million Prize, 1 In 292 Million Odds — And A Few More Lottery Numbers : The Two-Way The record-breaking powerball prize rose to new heights this afternoon. But did you know Americans spent more than $70 billion on the lottery last year? A machine prints Powerball lottery tickets at a convenience store in Washington, D.C. on Thursday. Saturday's jackpot has risen to $900 million. One number has everybody's attention this afternoon. But why stop at one? The eye-popping, record-breaking Powerball jackpot value, as of Saturday afternoon. If no one wins tonight, the jackpot could crack a billion. The cash payout that rarely gets the boldfaced headline treatment, but it's the more likely winning amount. The vast majority of jackpot winners choose the cash payout, even though it's always significantly smaller than the jackpot. You could hypothetically benefit from choosing the upfront payout — provided you invest the money instead of spending it. Which of course is exactly what you'd do, right? The tax man cometh. If you win and choose the lump-sum payment, expect to pay north of $200 million in federal taxes, at the 39.6 percent top income bracket — not counting state income tax. One in 292 million. Those are your odds of winning the jackpot. Not one in a million, not one in 10 million ... one in 292 million. Are you channeling your inner Lloyd Christmas right now ... "So you're telling me there's a chance?" Here's a way to more viscerally experience the long odds. The Los Angeles Times put together a demonstration of playing the Powerball odds, in chunks of $100 or $1,000 or more — tallying up your total losses over time. You can plug in truly enormous amounts of money and watch probability at work all afternoon, if that sounds like fun. So far, this reporter is down 104 grand. That was the range, as of 2012, of total payouts by U.S. states, as Steve Tripoli reported for NPR in 2014. That is, of all the dollars paid for lottery tickets, that's the percentage paid back to winners. West Virginia claimed the 15 percent, Massachusetts the 73 percent, while most states were in the 50 to 70 percent range. (You can look up your own state in our chart). For the record: Those are all abysmal rates by gambling standards. Most casino games pay back more than 90 percent, Tripoli says; the house still wins, of course, but it doesn't win by nearly as much as state lotteries do. The vast majority of American states offer a lottery these days. Alabama, Alaska, Hawaii, Nevada, Utah and Mississippi are holdouts, refusing to participate in either Powerball or Mega Millions. Some states cite religious objections, while in Nevada, the powerful gambling industry views lotteries as competition. Residents of those states can still play the lottery — but they have to travel to a participating state to do it. That's more than $70 billion -- the total amount Americans spent on the lottery in 2014, the most recent year for which data is available, according to the North American Association of State and Provincial Lotteries. CNN Money calculates that's more than Americans spend on sports tickets, books, video games, movie theaters and recorded music, combined. NASA's annual budget, for comparison, is around $17 billion. Total U.S. foreign aid for next year: just shy of $38 billion. That's the average per capita spending on lotteries in America, as calculated by Derek Thompson in The Atlantic last year. Of course, the cost isn't distributed equally, he notes. There's geographic variation — with annual spending north of $700 in Rhode Island, South Dakota and Massachusetts, based on state populations, while well under $100 per capita in other states. There's also variation based on income. Study after study has found low-income communities spend more of their money on lotteries than high-income communities, Thompson writes. That economic variation is why people call state lotteries regressive taxes — that is, a way of funding the state that disproportionately takes money from the poor. On Saturday, Vox pointed out an intriguing decade-old study suggesting that lotteries become less regressive as the jackpot size increases — that is, richer people are more likely to buy tickets for big prizes, lessening the disproportionate impact on the poor. Economist Emily Oster, then a graduate student at Harvard, suggested that a jackpot of $806 million would actually be progressive instead of regressive. At the time, that jackpot size was theoretical — but not any more. According to the lottery industry's own trade magazine, for every dollar spent on the lottery, an average of 27 cents goes to the "beneficiaries" — the oft-touted government spending programs supported by a lottery, usually in areas like education or recreation. A cut goes towards administering the lottery (which is far more expensive than collecting a tax — one analysis by a conservative think tank found lotteries are up to 50 times more costly than tax collection). A chunk, of course, goes towards the winners. Some goes to retailers, some to the companies that design and operate the lottery systems. What's left goes into state coffers. The average might be 27 cents to state expenses, like the industry says, but it can be as low as 11 cents to the dollar, NBC News reports. That's the impact of a lottery win on net happiness, at least at first. A famous 1978 study found that major lottery winners were no happier than ordinary folks, and actually got less joy from daily activities. A 2008 Dutch study found winning the lottery doesn't make a household happier. Now, a caveat: Two studies out of England suggest that it is possible to win the lottery and be content — but only eventually. OK, if you insist: You can't increase your odds of winning the lottery, but you can increase the chance that — if you do win — you won't have to split the jackpot. People tend to include birthdays and other dates in their lottery numbers, mathematician Aaron Abrams told NPR's Robert Siegel in 2012, which means more numbers between 1 and 31. And people have a bias towards odd numbers. So, for best results: Even numbers higher than 31. But have we mentioned? One in 292,201,338.